Gained his Master Degree on Rural Sociology from Bogor Agricultural University in 2005. He has been attending some trainings such as: Certification of Sustainable Forest Management (PHPL) from Indonesian Ecolabelling Institute (LEI) in 2008; Training PHPL Up-Grading in Forestry Training Center (Pusdiklat Kehutanan Bogor) in 2010; Training of technical assistance for rural farming communities organized by the Sajogyo Institute Bogor (science) in 2005; Journalism training organized by Harian Rakyat Merdeka in Jakarta (2001) and Management Training of BMT (Baitul Mal Watamwil) held by ICMI (Association of Indonesian Muslim Intellectuals) in. Karanganyar, Central Java, 2005. 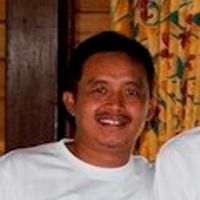 In 2012-2013, Doni has involved several times as HCV 5 and 6 assessor in many companies such as Sinarmas Forestry /Asia Pulp and Paper (APP) PT SHJ-1, PT SHJ-2 West Kalimantan Province, PT Finnantara Intiga West Kalimantan Province, PT Arara Abadi, Riau, PT WKS. Jambi and some of the oil palm plantation company in Kalimantan and Sumatra in 2011. He has ben involved in RSPO certification audits for several companied such as PT PPP, Aceh and North Sumatra, PT GPI, South Sumatra. Doni also involved in ISPO audit on oil palm plantation companies including PT SAL-1 Jambi, Central Kalimantan and PT GSDI. Involved in PHPL certification audits for several companies such as PT Kodeco Timber in 2013 South Kalimantan, PT Inhutani Meraang Berau District, PT Puji Sempurna Raharja, Berau, PT Sumatera Riang Lestari Prop. Riau in 2011, PT. Teluk Bintuni Mina Main Agro Prop. West Papua in 2010 and PT. ITCIKU East Kalimantan Province. From 2005 – now, Doni works as a freelance in BAPPENAS, Ministry of Rural Development (KPDT) and the Ministry of Public Works Cipta Karya as the evaluation team and as a freelance consultant in some consultanting company in Bogor and Jakarta. In 2006-2007 he worked at JICA, UN-HABITAT and UNDP.